Martin J. Kifer arrived at High Point University in Fall 2009. 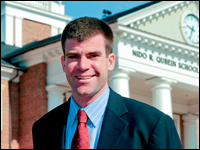 In addition to directing High Point University’s Survey Research Center, he is an Associate Professor in the Political Science Department. Originally from Lexington, Kentucky, Martin graduated from Earlham College. He earned his M.A. and Ph.D. in Political Science from the University of Minnesota. After completing his graduate coursework, Martin worked as an Analyst for the international and corporate team at Greenberg Quinlan Rosner Research, a political consulting firm based in Washington, D.C. His assignments included managing nationwide surveys, focus groups, and in-depth interviews in the U.S., Eastern and Central Europe. Martin focused on education and health care policy at his most recent job as a Survey Researcher for Mathematica Policy Research, Inc.
His research and teaching interests include U.S. foreign policy, political campaigns and new media, survey research methods, and American political opinion and behavior. High Point University Survey Research Center surveys people in NC and beyond about crucial public affairs issues and reports the results as a public service.